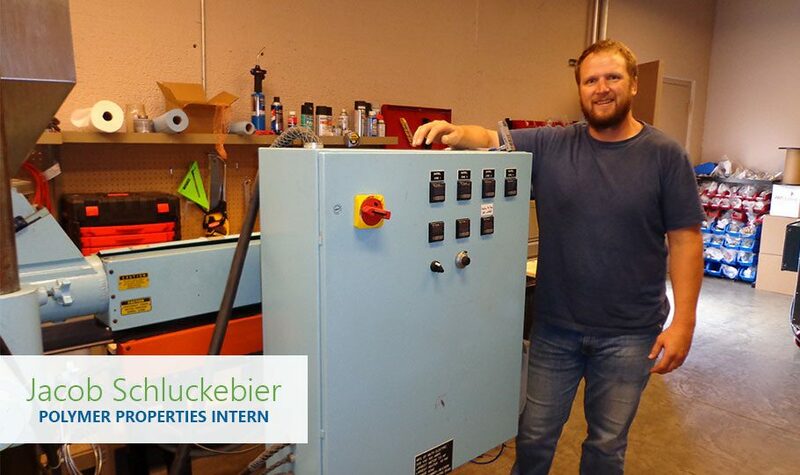 Jacob Schluckebier is a Polymer Properties Intern for Raven Engineered Films in Rapid City. Jacob is a Mechanical Engineering student at the South Dakota School of Mines and Technology in Rapid City, South Dakota. He comes to Raven after having ten years’ experience in the oil and gas industry as well as a bachelor’s degree from Chadron State. Jacob’s summer as a polymer properties intern has consisted of both research and hands-on application. In addition to learning as much as he can about the polymer industry, he has been focusing his work on refining a Low Density Polyethylene welding rod that Raven customers can use to repair their films as needed at their own sites. It has been a rewarding experience for Jacob so far. “Doing the research on extrusion die design and then designing and machining the die was a good challenge,” Jacob said. “Getting to see it work with the rest of the equipment and making the necessary adjustment will be very rewarding.” The work Jacob is doing to get an effective welding rod to customers will prevent contamination of the ground and air from liquids and gasses. “I know Raven develops and produces a variety of products that may not be seen or known by the general population yet they play an important role in several industries,” Jacob said. Further developing our products which work ‘behind the scenes’ to protect us and the environment is how I see the idea of 'solving great challenges' come to life. While Jacob is working behind the scenes to protect Earth's resources, he is also doing his part in upholding Raven Values. The value of service resonates with his work this summer as he is ensuring that the films produced serve customers well. “To me, it means using my time and talents for the benefit of others,” Jacob said. Jacob encourages future interns to learn about the company and industry they are in, in addition to learning what is required for the job. As his career continues, Jacob hopes to apply what he has learned in both fields of study, solving technical challenges within the oil and gas industry. "[Service] to me... means using my time and talents for the benefits of others."